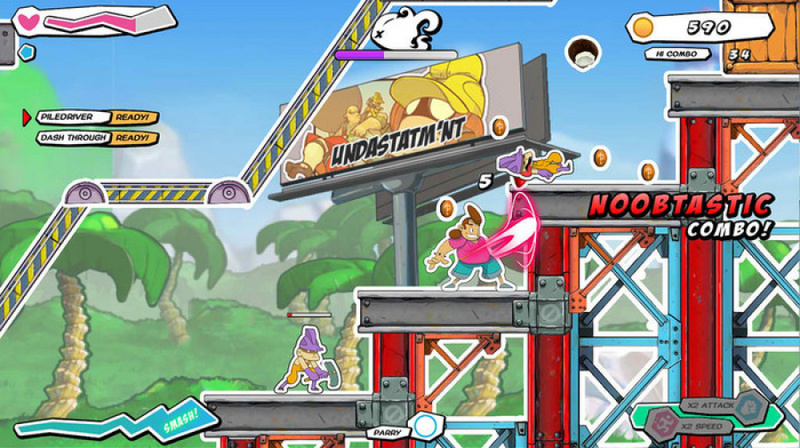 Kickstarter-funded title Super Comboman could be coming to the Wii U eShop, we can exclusively reveal. We've been speaking to Interabang Entertainment's Justin Woodward about the forthcoming platforming adventure, which raised $16,170 on Kickstarter last November — just a little over the target goal of $14,900. According to Woodward, Super Comboman is "2D physics based action brawler that is a mix between Final Fight, Smash Bros. and Marvel Vs Capcom" where the player uses their "combo momentum" to solve puzzles, destroy the environment and beat up gangs of enemies. Like Paper Mario: Sticker Star, the game has a sticker theme, with characters getting "peeled" and "stuck" into each scene. The game is currently being developed for PC and Mac, but because it's being built using Unity 3D, a port to the Wii U would be fairly straightforward. However, Woodward is keen to stress that such a conversion depends entirely on how well other editions of the game perform commercially. We are extremely interested in porting Super Comboman to Wii U but we would need more interest to do another crowd-funding campaign. Right now, we are interested in getting the Nintendo audience involved with our development and to see what we need to do in order to either launch a Nintendo-focused crowd-funding campaign or just figure out how to fund the port ourselves after the game is completed. If you ask us, Super Comboman is looking pretty sweet and is just the kind of game we'd love to see on the Wii U eShop. Hopefully the PC and Mac versions will be successful, paving the way for a Nintendo edition of the game. Is this a title you'd personally invest in? Drop a comment to tell us, and in the meantime, check out the (now out of date) Kickstarter video below. @undead_terror Because it's Unity 3D? 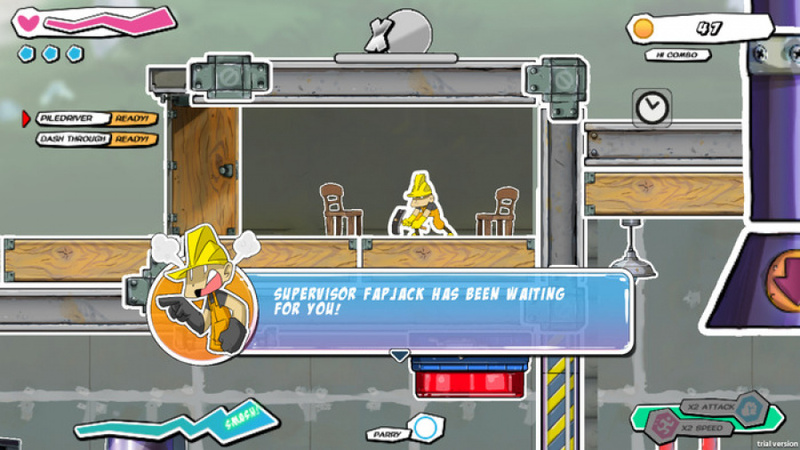 "Noobtastic" and "Supervisor Fapjack"? I do hate the internet humour "self-awareness" fad in games. Asides that, looks a well-made brawler. I'll buy it, but only if they add Afro ICJ as an unlockable character. YES. I would buy this game straight away if it came to the Wii U.
Kickstarter is just not for me. If the final product is good enough then they can have my money. I guess I'm a little old fashioned... like good root beer or whoever CC is. I agree.. sometimes. If It's a well known developer whose work I have played before, then I feel I can reasonably get in on the action. As good as I'm sure many of the crowdfunded indie games are going to be that come out of this deluge of kickstarters, I'm not risking my money with a new development studio who have never released a game before. @Raylax Thanks for the response to our silliness. No self aware generic internet humour over here. Just inside jokes that we want people to be a part of. Not a big fan of memes but some stick. We like Flapjacks and so we took of the l. Have any silly names for combos we would like to hear your ideas! @JFug That makes sense. I think that will take more demand from larger publishers who are willing to take the risk on new game mechanics and ideas. When there is more traction there will be more retail games punching you in the eye. I would be all over this game if it came to WiiU, the gameplay looks really fun. I would back it for sure. That guy in the beginning of the video with the NES controller shirt... I feel like everyone owns that shirt. Including me. @icjman : All my money. Take it. @icjman No self aware generic internet humour over here. Just inside jokes that we want people to be a part of. inside jokes? with 99% of the internet being the in on the joke. right. Looks sweet. Still it's sad thzt the Wii U version depends on other versions performing. I greatly despise internet humor. So no thanks. @Phantom_R That shirt was so original at first. Guess everyone loves Nintendo... and shops at Target. @luminalace Thanks! It is not that the Wii-U version depends on the other versions selling. For indies It is more about timing and the ability to deliver something good with the resources available. Since Nintendo is being more open to developers and less stringent with their guidelines you will see more exclusive content or day one releases on the Wii-U which is good fore everyone involved. Great article NL, I've been hyped for this game from the get go! If it comes to the WiiU I'll definitely be picking it up day one! The guys at Interrabang seem really passionate about this game & I'm sure it will be a top quality title. You guys have my support! Nice game ... Hopefully I'll be able to pick this up in the summer???? Honestly, I believe that to be be norm in all consoles right? Be patience though more retail games are coming Q3. i will buy it if it comes on the wii U, i stopped bying games for pc or other consoles, it would be cool if you can play this with two players. and when your finished with this project guys, you should start making a beat em up game, with up to four players lol would be cool. I would want to try a demo first before buying, even if I have to play a PC demo. @duskao So is the PS3?! Well I'm always on board for games like this. It's a phenomenal looking game and I really do hope to see a Wii U release. Honda player Mike Ross in the house!! LOL Funny dude! This looks well made in every aspect. I can see all the thought and hard work put into every detail. I dig it! Put it on the WiiU (PLEASE!!!!) and dont over think the WiiU Gamepad options - just use it as the sticker book so one can upgrade their combos etc. on the fly - seamless. Super Comboman fuses the lag from Smash Bros with the awesomeness of Marvel vs Capcom ! @arrmixer Agreed, they have something up their sleeves in the up and coming months for sure! Q3 and beyond. Meh, not that super! Fapjack, does it really mean what I think it means?! Oh deary!